Hey there! In this blog post I’m just introducing one of the newer works I’ve done, the process I used, and a new technique I tried. 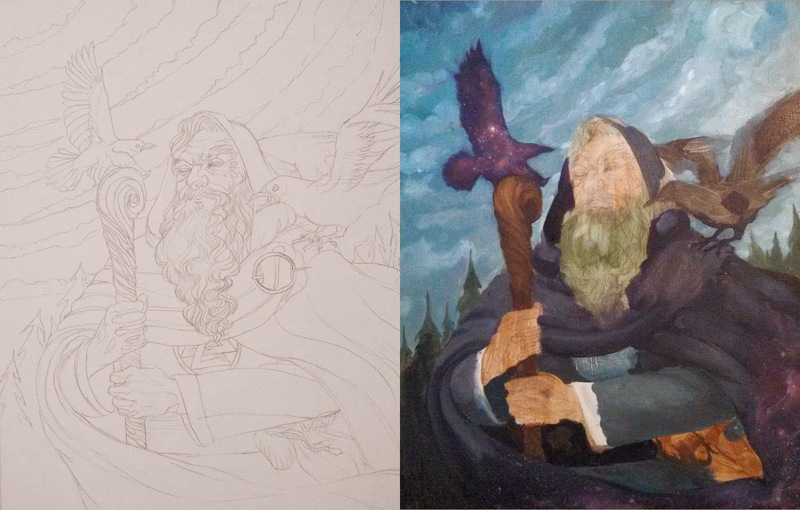 First, I had excitedly began my painting “The Whispers of Ravens” after immersing myself in Norse mythology for the weekend because of the History Channel’s TV series Vikings. I wanted to do a painting inspired by the old myths and take the opportunity to insert more male characters into my work since my portfolio had a majority of female characters. 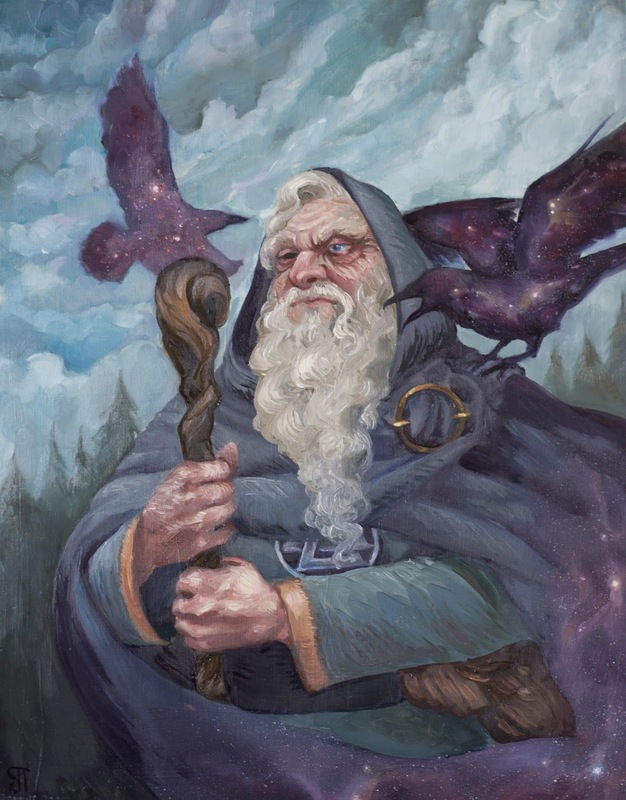 Odin, in Norse mythology, had two ravens named Huginn and Muninn (“Thought” and “Memory”) who would fly around the world and report to him everything they saw. I liked this concept and the composition came to me rather quickly. This shot of Odin listening to his ravens while looking forward with an age old calm. Now I’d become frustrated with working on canvas because it feels like a fight with the paint to get detail on such a textured surface. I like working with thick paint and wanted to get tighter with my work so I looked around online to find some kind of technique, whether it was to change oil mediums or the surface I was painting on, that would accomplish that. I discovered a video tutorial by Cynthia Sheppard, I love her work, which details her process with her painting “Omens.” In her preparation Sheppard used Matte Medium to seal the drawing on illustration board and then painting over it. I had heard about this method very briefly before but discarded it until I saw the video, I ordered the Matte Medium to try it for myself. Also, I did try some under painting but found that for the most part it was excessive in my process. So I found I really liked this technique because I can get as detailed with the drawing as I want and be able to keep the feel off it. I also love the slicker surface and even use linseed oil to “oil out” areas before I work on them. I really enjoyed painting this piece and adding fun effects with the brush. If anyone has any questions about this process I’ll be happy to answer them if I can.